This award is presented annually by our club to a Kurri Kurri TAFE mining student and is to commemorate the Cessnock Rotary Club’s Charter President and founding member, James Johnstone, who was responsible for the formation of the Club in 1937. James Johnstone migrated to Australia from Scotland and became a mining engineer and rose to be the General Superintendent of JA Brown and Abermain Seeham Collieries. The award named after him was first presented at the Club’s 50th Anniversary in 1987 and is awarded to the highest achieving mining student at the Kurri Kurri TAFE. This years award was presented to Michael Millgate who was accompanied by his wife Katie and who spoke of his life and his achievements in the mining industry. Also present was Garry Evans who was Michael’s teacher at Kurri Kurri TAFE. 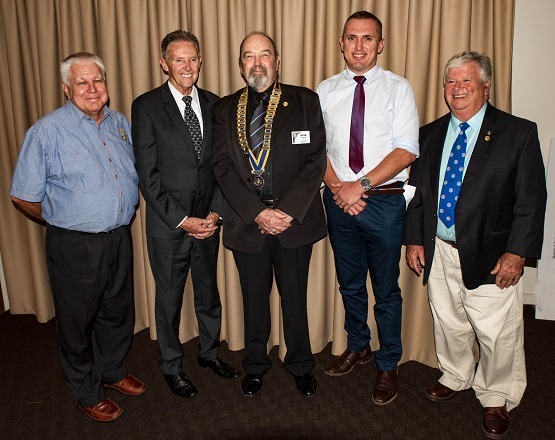 They are pictured below with President David, Past President Ross Lidbury who organised the night and Past District Governor Greg Bevan who gave a detailed history of the award.